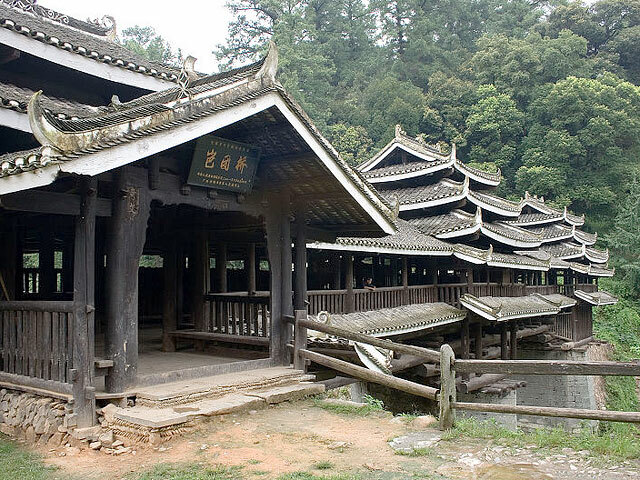 The Wind and Rain Bridge is characteristic feature of the Dong minority's architecture, along with Drum Tower. A wind and rain bridge has a stone foundation and columns with acute angles to deflect the power of a flooding river; the system of the bridge neither is amazing as no reinforcing materials nor was one nail used. Besides Chengyang Wind and Rain Bridge, Batuan Wind and Rain Bridge is the most well-known Wind and Rain Bridge in Sanjiang County. Although smaller than the Chengyang Bridge, Batuan Wind and Rain Bridge is six years older which was built in the 2nd year of Xuantong period in Qing Dynasty. Unlike other Wind and Rain Bridge with only one lane, Batuan is unique for having two separate lanes for people and livestock. Batuan Wind and Rain Bridge is 50 meters long and 4.5 meters wide, 30.4 meters between abutments, made up of 2 arches, 2 abutments, 1 pier and 3 pavilions. It has something common in modern double-layer flyover, however, in different approaches. The pedestrian way of this bridge is constructed by two layers of brackets consisting of 9 round logs, whose diameter is about 40 cm, and beams between brackets of the same material and connection approach. The animal ways which subtly hangs on the southern side of the pedestrian way is separated from it in a different layer. The bridge lays stress on making use of landform and existing conditions, praised by experts Batuan Wind and Rain Bridge as a model of folk bridge architecture, unique in all times and in all over the world. Standing on the bridge offers visitors a perfect view of Dong village and charming landscape around.